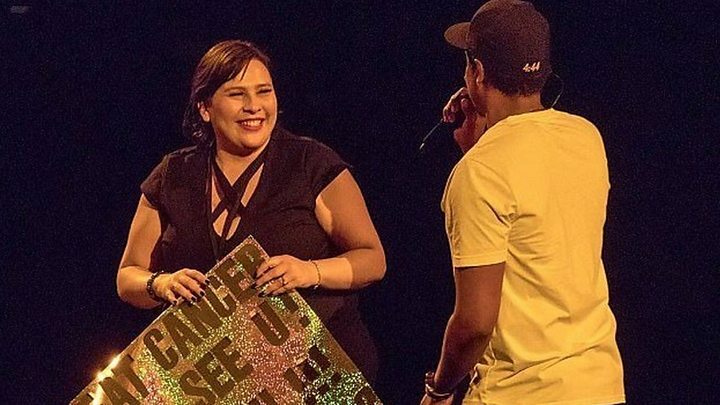 The rapper paused to read Christina Cruz's home-made sign, which said: "I Beat Cancer 2X 2 C U! I LOVE U!!! SELFIE OR HUG?" "You beat cancer twice?" the star said. "I gotta give you at least a hug." He then brought the woman up on stage and posed for several photos with her, as the crowd cheered. "This is exactly who my message was for," he told the audience. Throughout the weekend, Christina took to social media to recount the "best night" of her life. "I can't believe he pulled me on stage and I got to hug him not once but twice!" she said on her Instagram account, which has since been made private. "Meeting Jay-Z was a dream come true," she told BBC News. "Even better than I could have imagined." Cruz said she'd been overwhelmed by all the "love and support" from fellow fans after the concert, and was "still in shock". Jay-Z's California date came near the end of his tour, which has criss-crossed the US since October. Did Jay-Z's album really go platinum in five days? Introducing that track in California, the star called it "the most uncomfortable song I've ever written". The lyrics address his infidelity - which also informed his wife Beyonce's last album, Lemonade. "Look, I apologise, often womanise," he raps on the track. "Took for my child to be born, see through a woman's eyes." After playing the song at the Oakland arena on Saturday, the New York native told the audience: "I swear Oakland is just like Brooklyn, I feel at home here." Did Jay-Z's 4:44 really sell a million copies in five days?